The greatest concentration of Russia’s holiest Muslim places can be found in Bashkiria and Tatarstan, two neighboring provinces in the southern Urals and the Volga region. These places have well-preserved relics of the medieval Golden Horde Empire, which spread Islam among the locals. The predominantly Islamic republics of the North Caucasus are also important destinations for Muslim pilgrimage. Historians still disagree as to how and why this mausoleum was built. Some claim it was erected by the beautiful Souve over the grave of her beloved. Others insist that it is the final resting place of an Arab sheikh. Legend says that when the sheikh felt his death was close, he rode into the open steppe on a camel. He gave the camel free rein, and then decided to build his mausoleum at a place where the camel stopped of its own accord. Modern researchers believe the mausoleum belongs to a local governor who ruled on behalf of the Turkic Khan Uzbek. The mausoleum, which is 600 years old, is an important national heritage site. There are inscriptions in Arabic still preserved above its entrance. According to some old eyewitness accounts, there is a collective burial site that held several wooden coffins under the stone structure. The Dagestani town of Derbent is considered to be one of the oldest living human settlements. It has two holy places that are especially revered by Muslims in the North Caucasus: the Tutibike Mausoleum and the Kyrkhlyar. The Mausoleum was erected in 1787-1788 by the Khan of Derbent and Kuba, Fet-Ali-Khan, in honor of his wife and co-ruler of Derbent, Tutibike. Legend says that Tutibike was a very wise and courageous ruler; thanks to her, Derbent came out victorious after a nine-month siege. In the direct vicinity of the mausoleum there is a place called the Kyrkhlyar (which means “forty” in the Turkic language). This is a burial site that holds the remains of Islamic martyrs. The sarcophagi above the graves are hewn from whole stone blocks. Legend says that the Kyrkhlyar is the final resting place of 40 Arab battle captains who died during the struggle to strengthen the influence of Islam in the North Caucasus. The ancient fortress of Kala Quraysh sits 1,000 meters (3,300 feet) above sea level. It was the first fortified station built as part of the spread of Islam in the Caucasus. It is believed to have been founded in the 7th century AD by descendants of the Quraysh tribe (the very tribe to which the Prophet Muhammad was born). Kala Quraysh is sometimes called the Dagestani Machu Picchu; the settlement looks like a terraced stone labyrinth on the slopes of a tall mountain. The Kala Quraysh fortress is the site of the oldest mosque in Russia, which was built in the 9th century. There is also an ancient burial vault and a museum. There are 59 holy burial sites, called Ziyarts, in Chechnya. The most revered of them is in the village of Haji Evla. In the 19th century the village was the home of the Sufi sheikh Kunta-Haji Kishiyev, a Chechen holy man and pacifist, and one of the missionaries who preached the Zikr (“Remembrance of Allah”) creed. There is also a holy spring near the place where Kishiyev's house stood; water from that spring is believed to have medicinal properties. Pilgrims can also visit the crypt where Kishiyev’s mother is buried. It is situated nearby on Mount Ertina, which the Chechens consider a holy place. 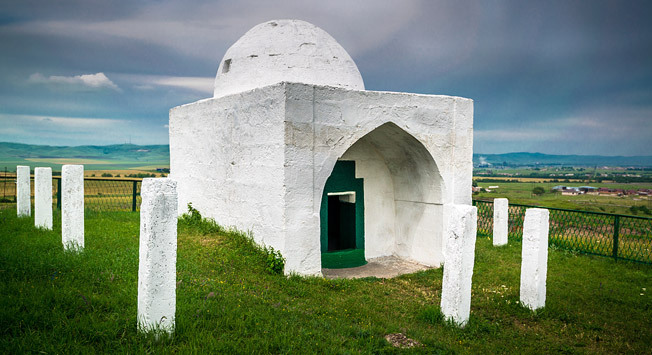 There are two well-preserved ancient mausoleums dating back to the 12th and 14th centuries some 40 km (25 miles) from Ufa, the capital of Bashkiria. One of them is at the Akzirat Muslim cemetery (Akzirat means “White Cemetery” in Bashkirian). Legend says that the mausoleum was built in the 14th century for Haji-Hussein-Bek, the first Imam on the territory of what is now Bashkiria. The order to build the mausoleum was given by none other than Tamerlane (Timur), the famous Central Asian conqueror and founder of a great Timurid empire, which had its capital in Samarkand. Not far from the mausoleum there are several gravestones with inscriptions in Arabic; they are believed to mark the graves of Tamerlane’s battle captains. The Hussein-Bek Mausoleum is regarded as one of the holiest Muslim places in Russia. A mere 10 km away there is another ancient mausoleum; this one marks the grave of Turukhan. According to some historians, he was a descendant of the great Genghis Khan, the founder and first great ruler of the Mongol Empire (which, incidentally, had the longest contiguous border of all the ancient empires). Historians say that Turukhan, like Hussein-Bek, was an enlightened Muslim ruler. Another important place of pilgrimage in Bashkiria is the Auliya spring (Auliya means “holy” in Bashkirian). It is situated on Mount Aushtau in the Southern Urals. The spring, which is said to have healing properties, flows for just over 30 days in late May and early June, gathering tens of thousands of pilgrims every year. People bathe in the spring and collect its holy water, which they believe can rid them of kidney stones, as well as heal respiratory and stomach diseases. Waters of the spring are said to acquire their medicinal properties only after May 15. Many Muslims believe that ascending Mount Aushtau counts as a minor version of the Hajj. The pilgrimage consists of two stages; the first half of the journey is to reach the holy spring, and the second to climb the actual summit of the mountain. There are three graves on the summit; legend says they hold the remains of three Islamic missionaries from Osh killed in the 13th century by the locals. After repenting, these same locals buried Sheikh Muhammad Ramazan Al-Ush and his companions at the top of the mountain, immediately causing the appearance of the holy spring on its slopes. On the banks of the Volga River, some 140 km from the Tatarstan capital Kazan, there are ruins of the legendary ancient city of Great Bulgar. It was one of the greatest cities of the medieval Golden Horde Empire. Now it is an important pilgrimage destination for Russia’s Muslims. Apart from the ancient ruins, all that remains of Great Bulgar is the village of Bolgary and the walls of a large mosque with a minaret dating back to the 13th century. Across the street from the entrance to the mosque there is a well-preserved Northern Mausoleum (which was used by the Bulgari nobility). To the east of the mosque is the Eastern mausoleum, which was converted to an Orthodox church in the 18th century.